Trained at the famed Pratt Institute in New York , Bill Minor discovered his taste for literature in art school during a time of uncertainty about what to do with his life. 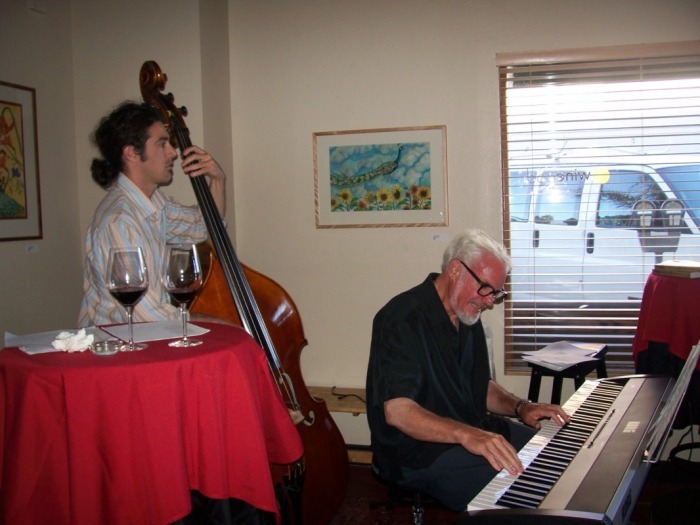 His passion for jazz was developed as a youth playing jazz piano at the 456 Jazz Club in New York . It is hard to imagine this gifted writer and musician once struggling to find his voice. An artist in every sense of the word, Bill excels in all areas from visual to musical. He has found a way to weave all of his talents together and create magic with them. Reflecting on the present challenges and colorful former lives of his aging parents, a momentary crush on a cocktail waitress with an uncanny resemblance to Sandra Bullock, and the joy of q-tips, Bill Minor started off the August 18, 2008 Pizza and Prose Art and Literature event by giving the audience a taste of his newly released cd, Mortality Suite, Poems and Music. 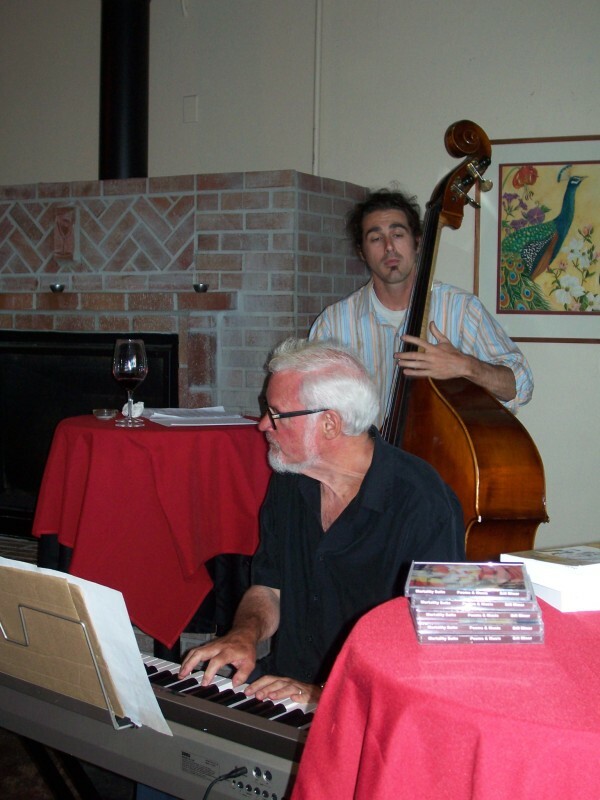 With jazz musician Heath Proskin backing the rhythm of his words with his stand up bass, Bill shared the story of his life with bittersweet moments tucked into vivid memories. He shared snippets of the life-long love affair between his parents. He addressed the intricacies and idiosyncrasies we all face on a daily basis. He did all this before embarking on Trek - Lips, Sunny, Pecker, and Me, his latest book; a comic novel about a California family’s journey back to Detroit in 1976. There are more whimsical pieces, such as when he addresses the discomfort listeners might feel as he speaks of “going all the way,” and “beyond the bounds of good taste,” with “tympanic membrane joy,” in his love for q-tips. There was no need to worry during his performance at Cava Wine Bar in Capitola, where the audience was clearly amused and enthralled. Moving from the spoken word to written text, Bill also read from his book. It begins with a prologue from Pecker (short for Peckerwood), one of the main characters. While going through his father’s papers, as executor of his estate, he discovers a series of letters that seem to recount a trip the family took in 1976. A trip Pecker, who was 14 at the time, has no memory of 30 years later. He has no idea if the father, who died choking on an herbal almond, intended for the letters to be sent to anyone in particular or if any of it ever actually happened. Bill ended the evening by going back to the spoken word performance with Heath’s bass once again following the beat of his words. The last piece was an actual letter written from a soldier to his daughter during the civil war. The soldier was a relative of Bill’s who had been “on the wrong side of the civil war.” He describes the heartache and horror of war. A man with enough compassion to wonder if the dead Yankee he wrote of also had a little girl waiting at home for his return. As a writer, musician, performer, and visual artist, it is clear that however “solidly white and thin” his hair might be, Bill is not “frail, thin,… passive” or “at the end of anything.” This encore performance was inspiring and just as last year, once again, he left the audience wanting more. Mp3 recordings of his work can be found at J.J. Webb's very popular and highly acclaimed "internet broadsides" and Flash Animation site, http://members.cruzio.com/~jjwebb and at http://members.cruzio.com/cafe/greenroom.html where the "Sandra Bullock" poem, among others, can by found.